Decanting Vintage Port - the "Hersh Method"
Much has been written about decanting bottles of Port, yet it all seems so complicated and ritualistic. 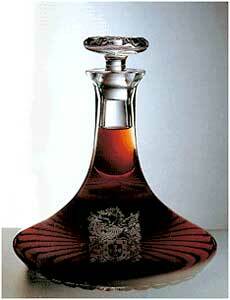 Various traditional decanting regimens have been employed for hundreds of years, with all sorts of pomp and circumstance. We will explore some of these time-honored methods and understand the benefits of decanting bottles of Port, especially Vintage Port and the reasons for doing so. Just when it all begins to make sense, I'll toss tradition aside and describe a simple and straightforward process that I call the "Hersh method", which I use 100 percent of the time for decanting bottle-aged Port and more specifically Vintage Port. A large percentage of all Port-related inquiries I receive ask for information on the proper decanting process and seek insight into the length of time Vintage Port should sit in decanter. Although there are many sources of information about decanting Port, most lack detailed information and don't spend enough time explaining why decanting improves the drinking experience. I take a slightly contrarian view against the need for complicated or time-consuming customs. Let's explore for a moment the rationale behind decanting Port in the first place. Why decant a Vintage Port when a Tawny Port can be easily opened and poured without breaking a sweat? Some have even asked if they could drink a Vintage Port without bothering to decant at all. Decanting is necessary with Port wines that age in bottle versus those that age in wooden casks. Bottle-aged Ports include Crusted Port, Traditional or Unfiltered LBV Port (Late Bottled Vintage) and of course, Vintage Port (which I will occasionally refer to as VP). The aforementioned categories of Port are not filtered before bottling (VP is not "fined" either) and, therefore, age in the bottle. The "crust" or sediment (a.k.a. "deposit" or "dregs") that forms inside of the bottle is nothing more than the dead yeast cells and in the case of Vintage Port - particulate matter from grape skins, seeds and stems. They are not in any way harmful but neither are they pleasant to drink. Wood-aged Ports such as Tawny Port (10, 20, 30 and 40 years old) have their sediment filtered out before bottling and don't age further. One type of wood-aged Port known as Colheita (a vintage dated Tawny) may, in some cases, contain sediment and continue improving with age in the bottle. You will never forget the first time you experience drinking a glass of Port that has not been properly decanted. Port consumed without first removing the sediment would be akin to drinking a cup of Starbucks coffee without removing the grounds. But there is more to decanting than just the removal of sediment, as necessary as that procedure is. The other reason for decanting a Vintage Port is to provide it the time to "flesh out" by allowing it to come in contact with oxygen. A great VP may age well for 20 -100 years and on rare occasions even longer. When the bottle is opened, these VPs need time to blossom and aerate. So what is necessary in preparation for decanting a bottle-aged Port? The conventional wisdom has always been to stand up the bottle of Port for a day or three, which allows the sediment to fall to the bottom of the bottle. The pleasure begins with the process of removing the cork from the bottle. Some people like to have fun and try their skill at removing corks from ancient bottles of VP in one piece. Even those who are very experienced with older Ports break corks before extracting them from the bottle neck. 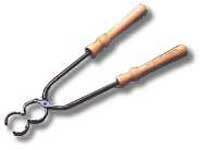 There are all types of corkscrews, Ah-so extractors, ScrewPulls, LeverPulls and even the infamous Port tongs. However, it pays to experiment with a number of these tools to find out which one works best for you. Do not get frustrated when you find that Port corks crumble or break inside the bottle neck. Using Port tongs takes practice, but it's an easy skill once mastered. Basically you take the device (pictured at right), heat it until red hot, and close it around the bottle neck below the cork until a circle around the neck has become very hot. An ice cube, cold wet towel or even a wet feather may then be used to "crack" the bottle by shocking the glass along the hot seam. This is mostly done for show and is a fun way to impress onlookers, but does require a bit of practice to become proficient. It is great to try this on a magnum of Vintage Port! Now that the cork has been extracted, it is time to remove the sediment from the bottle. In the Port Lodges of Vila Nova de Gaia where the bottling and subsequent storage takes place, a white "splash" mark was painted below where the label would appear. This is not done anywhere else in the wine world and actually is not even seen as much (with VP) as was the case in the past. This mark shows the cellar master or consumer which side of the bottle should face up when stored horizontally to keep the cork moist. It allows for the sediment to settle onto the lower side and form a crust. That is why Port lovers have always stood up their bottles to get the sediment to slide down the side of the bottle before they start to decant. We are finally ready to follow the traditional path to decanting a bottle-aged Port to remove the sediment. First we need to have a clean decanter, and I can't stress enough the importance of ensuring that there is no soap residue or musty smell in the decanter. I always give a quick rinse with warm water, followed by cold water and do my best to shake out all the excess beads of water. Some people feel the need to then rinse the decanter with a cheap ruby Port to "season" the decanter. Make sure you are in a room with good lighting, so you can see the sediment. The old ways die hard, and I still come across Port enthusiasts who use the "candling" method by holding a candle beneath the bottle neck, since the old bottles were made of transparent green, brown or charcoal colored glass. It was then possible to see into the bottle neck when the sediment was about to breach. Others prefer a flashlight and one serious wine geek friend of mine does utilize an antique decanting cradle, replete with a crank handle, as pictured here. Personally, I don't use such "devices" but we're still examining the traditional methods at this point. In reality, all that is required is a steady hand and a clean decanter with adequate lighting. Although it's not as impressive to watch, it works. The trick is to pour by hand into a decanter in one steady stream to prevent the "wave effect" disturbing the dregs while pouring. Stop pouring when the sediment reaches the bottle's neck. Some folks prefer to use a sterling or silver plated Port funnel, but I've also seen muslin, a clean pair of stockings (no joke!) or unbleached coffee filters used to strain out the sediment. If you have a steady hand and practice a few times, you'll be able to extract most of the liquid without the fine sediment winding up in the decanter. There is nothing as satisfying as pouring a crystal clear glass of mature Vintage Port from a decanter, except actually drinking it. At a Wine Spectator-sponsored Port tasting I attended a decade ago, Port expert James Suckling provided parameters for decanting Port. He mentioned that a Vintage Port that was less than 20 years old should be decanted two or more hours prior to consumption, with VPs 10 years old or less for three to four hours. He cautioned that older bottles are trickier; those up to 40 years of age should just receive an hour of air time and anything older should be opened and decanted just prior to being served. Richard Mayson, an astute British Port expert, author of many books on Port and a journalist for Decanter Magazine, espouses decanting young Vintage Ports for two or three hours. Ask five Port experts and you'll get a variety of opinions. It is now time to break with tradition and discover the philosophy and procedures for incorporating the "Hersh Method" of extended decanting, designed for bottle-aged and more specifically, VP. Let's back up a few steps. Having opened well over 1,500 bottles of Port (the vast majority of which were Vintage Ports) over the past 20-plus years, I can say that less is more. I may occasionally stand up bottles of Port, but don't find it necessary anymore. Before getting started, I gather a Port funnel, clean decanter and unbleached cheesecloth. The cheesecloth should be food-grade, the type used by chefs around the world to strain freshly made stock or to enclose flavorings like a bouquet garni to flavor a soup, stew or broth. This neutral material adds nothing negative from an aromatic or flavor standpoint. You can choose a Port on a moment's notice, taking decanting time into consideration. Standing wine up the day before becomes a moot point and allows for spontaneity. You salvage at least an ounce or two out of every bottle of Port, sometimes more, that would otherwise be lost to sediment. You can do this in a low-light situation and won't need a candle or flashlight. Virtually no discernible sediment will wind up in your wine; small fragments of broken cork will also be captured this way. Cheesecloth is sanitary, disposable and very inexpensive. Fold the cheesecloth in half so you have two layers, or even double again to get four layers for older VPs, which tend to have much finer sediment. Place the folded cheesecloth inside a Port funnel. You can then pour the entire bottle through the cheesecloth and funnel in a very short amount of time. You no longer have to pay attention to when the sediment starts coming out, and you don't even need a steady hand can manage this feat. In fact you want to pour every possible drop into the cheesecloth supported by the Port funnel, which has a fine mesh screen as a back up. If you're in a real rush, you can always "double decant," which means pouring the decanted wine right back into the bottle (after washing it thoroughly) to take it to a wine tasting or restaurant. 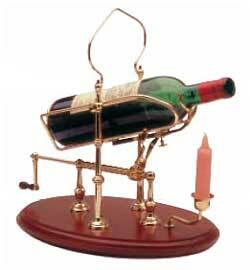 Just pour the wine into a decanter when you get there. Simple as can be? You bet! How many of you are thinking, "is he out of his mind"? Well, the best is yet to come. I have practiced what I like to call, "extended decanting" for Colheita and Garrafeira Ports, bottle-aged Ports and especially VPs. It seems that I was one of the very first to go against the wisdom of those who called for only one to four hours as a rule of thumb for decanting Vintage Ports. I can guarantee that more extended decanting of Vintage Port normally provides more drinking satisfaction than shorter periods of aeration. Opponents of this point of view argue that extending the time a Port spends in the decanter is akin to artificially aging the wine, softening the tannins and changing the way it performs. I don't disagree, if the wine is "over-decanted." I began experimentation with this method in the late 1980s after meeting Fonseca's Bruce Guimaraens and knew I was on the right path. He instilled in me the belief that extended decanting offered many benefits to Vintage Port consumption and told me that he normally opened bottles in the morning to be consumed after dinner. I got busy early and often, performing literally hundreds of trials while taking lots of notes. I began sharing the results with anyone who would listen. Today lots of people have been converted to "extended decanting times" for Port and share similar thoughts as to the beneficial results. Darker color: Like blood that oxygenates, the longer VP sits in a decanter the darker it gets. Density: a rare example of gaining weight being a good thing. Here it happens in a few hours. Mouthfeel: Robert Parker likes to use the word "unctuous" and it applies to well-decanted VP. Softener: a.k.a. how to tame a tannic tiger. The polymerization of tannins occurs in decanter. Aromatics: The aroma profile of Port significantly improves as the wine has an opportunity to bloom with airing. Integration: Nuances of oak and spirit require time to meld with fruit. Extended breating in the decanter provides time. Flavors: Become accentuated and more complex. Cask samples or young VPs can be enjoyed. Aftertaste: The length of the finish may be elongated (but not always) in most young and mature VPs. One of the most enjoyable facets of extended decanting is experiencing the metamorphosis of the Port as it evolves in the decanter. I take some small sips along the way and try to perceive the changes mentioned in the dynamics above and write down my observations. If I plan to let the Port decant for 10 hours but then sense that it is ready at 6 hours instead, I pour it back into the original (rinsed out) bottle, re-cork it, then pour from the bottle at serving time. As for ultra-long decanting times, I want to be clear for the record: I don't believe in decanting Ports for more than 12 hours, except for very specific evaluation purposes. I can count the examples on one hand when I have exceeded that limit. Cask samples and current vintage Ports aside, 12 hours in decanter is plenty. Conversely, there are Vintage Ports that I will only have in decanter for 1-2 hours. So my recommended decanting "window" is between 1-12 hours for VPs (primarily) depending on vintage and producer. Extended decanting of Port and especially VP is a good thing; but in my opinion, going too far - say 24 hours of decanting time - serves only to strip the Port of its true beauty while dumbing down the tannins and negating too much of the structural component of the wine. Some adhere to that practice for the sake of having something softer and (arguably) better in terms of aromatic and flavor profiles. I prefer to decant in order to enhance the freshness and natural components of a Port, not to alter its entire character. That said, a number of factors go into deciding how long a Vintage Port should be decanted. Usually at this point in my life, experience with specific vintages and producers is my guide. Don't go by the age of the Port wine, but pay strict attention to the date of bottling. An LBV or Colheita that was bottled recently will have had little time to deposit a crust and therefore, don't need to be decanted at all. Please note that the above times are generalizations and specifics of vintage and producer may often cause the above to vary. The above decanting times are meant as a guideline and not as an absolute range. For example, I'd decant a 1985 Graham's and a 1983 Warre's for 8 hours and 5 hours, respectively. A 1970 Fonseca or Niepoort, I would decant for 6-8 hours, while a Taylor 1945 for approximately five hours. Your mileage may vary.